Asthma is a disease of the lungs that often leads to repeated episodes of wheezing, chest tightness, breathlessness, and early morning or nighttime coughing, and currently affects approximately 8 percent of adults and approximately 10 percent of children in North Carolina. According to the U.S. Centers for Disease Control and Prevention, the causes of asthma are unknown. However, certain demographics are more closely correlated with asthma. Women, black adults, young people between the ages of 18-24, those who didn’t finish high school, and those with household incomes under $75,000 all have a statistically higher predisposition for asthma. Certain environmental factors act as triggers for asthma, including air pollution, allergens, and tobacco smoke. Two types of air pollutants can act as asthma triggers – ozone (found in smog) and particle pollution (found in haze, smoke, and dust). Ozone pollution is worse on hot days, while particle pollution can be high near industrial areas and heavy traffic. While there are few clear trends in asthma diagnosis rates in adults across the Mountain Resources Commission (MRC) region, there are several pockets where rates are low or high. Avery County has the highest asthma rate in adults, at 130.9 diagnoses per 100,000 people, while McDowell County has the lowest rate, at 37.7 diagnoses per 100,000 people. 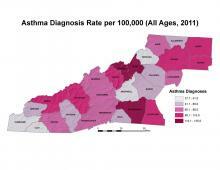 Areas of high asthma rates include Swain and Haywood Counties; Yancey, Mitchell, and Avery Counties; Rutherford and Cleveland Counties; and Wilkes, Surry, and Yadkin Counties. Areas of low asthma rates include Cherokee, Graham, and Clay Counties; Polk County; McDowell County; Watauga County; and Alleghany County. For rates of asthma in children, please see Children’s Health. North Carolina Department of Health and Human Services, Division of Public Health, Chronic Disease and Injury Section, North Carolina Asthma Program. Accessed from: http://www.asthma.ncdhhs.gov/index.htm. North Carolina Department of Health and Human Services, Division of Public Health, State Center for Health Statistics. Hospital discharge data, 2011. 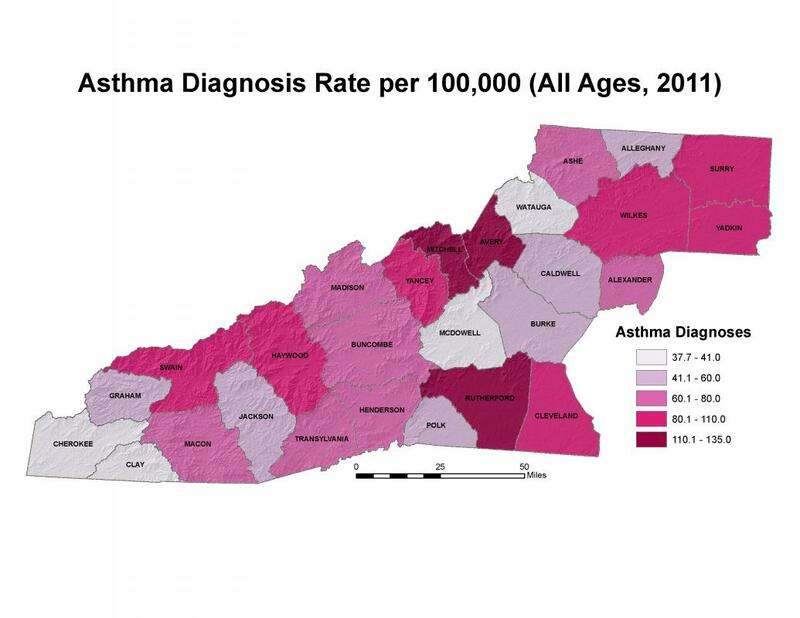 Accessed from: http://www.schs.state.nc.us/SCHS/data/databook/CD18%20Asthma%20hospitalizations%20by%20county.html.